When investigating options available for ecommerce systems you’ll most likely come across the Magento, Shopify and WooCommerce platforms due to the extensive marketing undertaken by these companies and their proven effectiveness within digital retail. It isn’t always clear which of these system is the right fit for an online retailer from viewing the features sections of the ecommerce providers’ websites. Each provider might have multiple versions of their system, with varying features which can’t easily be compared like-for-like. To save you time we’ve explained the differences between the platforms, and which you may find suitable depending on the size of your business. We have summarised below what WooCommerce and Shopify offer, and how Magento compares to them. Magento: Magento is a well-supported open-source ecommerce platform with a market share of 9% in the UK and 13% globally*. Magento has recently been acquired by Adobe and is offered in two versions - Magento Open Source and Magento Commerce. The latter is offered in a Starter or Pro pack. WooCommerce: An open-source ecommerce system which integrates with WordPress and is aimed at businesses with lower stock levels and turnovers. This system is popular among smaller retailers running websites on WordPress. There is no official enterprise version of WooCommerce, instead users have to employ a developer or agency to enable integrations or extensions available on the WooCommerce marketplace for it to work as an Enterprise-level ecommerce site. How does Magento compare to Shopify and WooCommerce ? 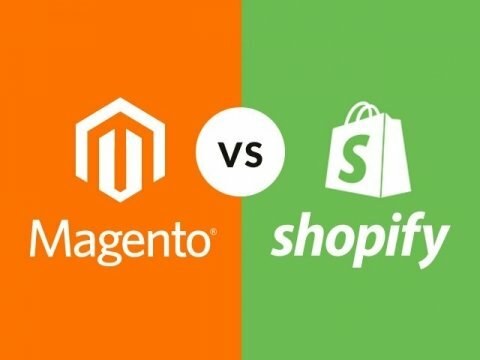 For the purpose of this article we’ll expand on the similarities and differences between Magento 2 (as Magento 1 will be not be supported after June 2020) , Shopify and WooCommerce. Remember that Magento 2 comes in Open Source or Commerce formats. Previously known as Magento Community Edition on M1, Magento Open Source on M2 is a free, out-of-the-box version of Magento which facilitates the creation of online stores for SMEs. Magento Commerce, previously known as Magento Enterprise Edition on M1, is geared towards medium and large businesses. Analytics: Ecommerce analytics is enabled through the native business intelligence feature, allowing you to evaluate the performance of the products. Search: Elastic searching is enabled, allowing for the search on the website to recognise products a user is searching for as they type, suggesting similar products and allowing a search by currency. Basic Shopify: Allows small businesses to run Shopify and includes an ecommerce website with features such as blog, adding of unlimited products, two staff accounts, 24/7 support, online marketplace and social media channel, manual order creation, discounting, SSL certificate, abandoned cart recovery. There is a 2% additional fee on all payment providers other than Shopify payments. This option excludes reporting, has a high fee for credit card transactions and excludes support. Shopify (standard): Includes all of the above features of Basic Shopify, but also includes five staff accounts instead of two, gift cards, professional reports, a cheaper rate on the transactions viaonline credit cards and other payment providers other than Shopify. Advanced Shopify: Includes all the features of Basic Shopify and Shopify, but allows for 15 Staff accounts, includes advanced report builder and third-party shipping rates. This version has the cheapest rate for online transactions for both cards and using a third-party payment system. ShopifyPlus: An enterprise-level ecommerce version of Shopify, ideal for selling high volume products and in a B2B environment. The strength of WooCommerce lies in its competitive pricing which online retailers can benefit from. Similar to Magento it is an open-source ecommerce system, so it comes with the benefits of easy data migration and code editing. The system has a large market share internationally and is supported by a community of WordPress developers. However, the ecosystem, is not as well regulated as Magento’s, leading to a lower standard of quality and complexity in the resulting site. WooCommerce users will need to arrange for hosting and website-to-ecommerce system integrations separately. Large businesses, wanting to run multiple businesses from the same ecommerce system and with multiple concurrent users might also struggle with WooCommerce as there is no enterprise-level version available. Magento offers a simple, free version of its ecommerce system ideal for small and medium sized businesses and enterprise-level solution in the form of Magento Commerce. WooCommerce will work for you if you’re a small retailer, with a small (1000 SKU’s or less) catalogue looking to sell to individuals online. Magento Commerce and Shopify Plus are comparable as both are enterprise-level ecommerce systems. Shopify Plus is the younger system, so as a result the number of enterprise level retailers using the platform is significantly lower in contrast to Magento. The number of Shopify partners in existence are around half that of Magento, meaning less expertise and options are available in the marketplace. If you’re running multiple storefronts or are considering opening more stores in the long-term this is not a feature in Shopify, whilst this is a core feature of Magento 2 (Commerce). Regardless of the plan you’re on, Shopify charges a percentage of online transactions, this is in addition to the fees charged by any third-party payment providers. If you’re selling in high volumes and your buyers tend to buy individual items at a time, this can get costly. Furthermore, as it's a managed solution the code is owned and managed by Shopify, so custom developments can be difficult to achieve. So what if you’re already using Magento? If you’re currently on Magento 1, now is the perfect time to plan for migrating to Magento 2. We’ve written extensively about the migration M1 retailers need to undertake and why, which you can read about here . The most important thing to consider is that: the discontinuation of security support means that after June 2020 no more security updates will be provided to you if you’re on M1. This will have serious repercussions for your customers and your ability to keep key data (bank details, personal data) and integrations secure. As one of only 45 Magento Partners in the UK, we’ve a team of dedicated in-house Magento Developers at your disposal to ensure all of your technical requirements are met. We specialise in creative web development, marketing and branding, supported by technical excellence in ecommerce, programming and optimisation. This means that we'll not only be able to help you secure the website now, but also work with you to ensure the digital and marketing strategy is in place to help you succeed in the future. Regardless of whether you’re currently using Magento 1, Shopify WooCommerce, we would be happy to provide impartial guidance as to the optimum solution for your future requirements. Get in touch with us here. Magento or Shopify – which is the best platform to sell online? Choosing the right online store platform is incredibly important. But what should you take into consideration when searching for the best option for your business?